The ArTICL library (pronounced “article”) lets Arduino programs send and receive TI link protocol-formatted packets at a low level. In addition, it includes a CBL2 class that lets the calculator emulate either a CBL2 device or a calculator speaking the CBL2 protocol (thanks to Cemetech member CVSoft for helping to make this possible). 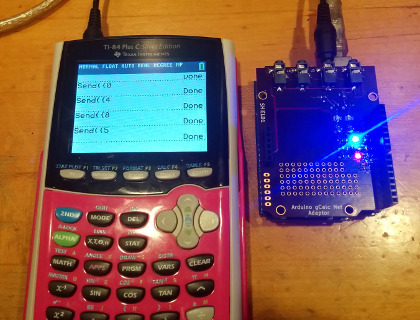 This means that you can use the Send() and Get() commands on your graphing calculator to control the Arduino, including turning LEDs and motors on and off, reading the state of buttons and switches, and performing measurements with sensors. You could even use the ArTICL library to control a Norland Research robot with an Arduino. This entry was posted on Friday, October 31st, 2014 at 12:01 pm	and is filed under library. You can follow any responses to this entry through the RSS 2.0 feed. You can skip to the end and leave a response. Pinging is currently not allowed.